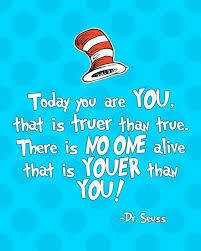 Next week March 4-8 the Royal Valley Elementary School will be participating in Dr. Seuss/Kindness Week. Monday- "Cat in the Hat" Wear a fun hat! Tuesday- "Green Eggs and Ham" Wear Green! Wednesday- "Oh the Places You'll Go" Wear a college jersey or shirt! Thursday- "The Sleep Book" Wear pajamas or comfy clothes! Friday- "Horton Hears a Who" What would you do to help someone? Wear red, white, and blue to promote good citizenship!